Edward Ormondroyd served in WWII and attended the University of California at Berkeley. 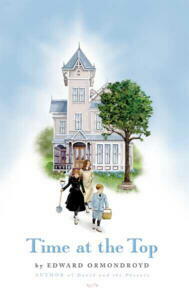 He has written several children's books and has raised seven children in upstate New York. 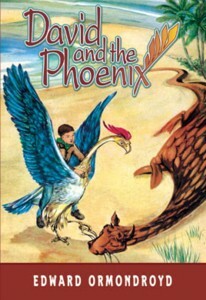 There's a cult following for David and the Phoenix… discover it for yourself if you don't know it already. Purple House Press brought it back to print in 2000, sold out the hardcover printing, and then issued it in paperback five years later. Oh goodie, now it's cheap enough to be a stocking stuffer for every 10-12 year old on your giving list. All in Good Time. Illustrated by Ruth Robbins. Berkeley: Parnassus Press, 1975. Broderick. Illustrated by John Larrecq. Berkeley: Parnassus Press, 1969. *Castaways on Long Ago. Illustrated by Ruth Robbins. Berkeley: Parnassus Press, 1973. New illustrations by Karen C. Rhine. Green Mansion Press, 2003. 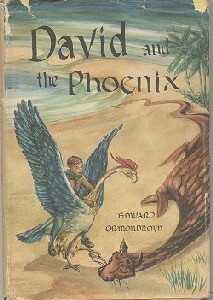 *David and the Phoenix. Illustrated by Joan Raysor. Follett Publishing, 1957. Weekly Reader, 1958. Purple House Press, 2000, 2005. Imagination Greene. Illustrated by John Lewis. Berkeley: Parnassus Press, 1973. Johnny Castleseed. Illustrated by Diana Thewlis. Boston: Houghton Mifflin, 1985. Jonathan Frederick Aloysius Brown. Illustrated by Suzi Spector. San Carlos: Golden Gate Junior Books, 1964. Michael, the Upstairs Dog. Illustrated by Cyndy Szekeres. New York: Dial Press, 1967. The Tale of Alain. Illustrated by Robert Frankenberg. Chicago: Follett, 1960. Theodore. Illustrated by John M. Larrecq. Berkeley: Parnassus Press, 1966. Theodore's Rival. Illustrated by John Larrecq. Berkeley: Parnassus Press, 1971. *Time at the Top. Illustrated by Peggie Bach. Berkeley: Parnassus Press, 1963. Purple House Press, 2002.